Add unlimited number of additional customer attributes to get all required information about your customers. Let customers fill this data on account creation and edit it in customer account. View and edit this information from admin account to add own notes about your customers. 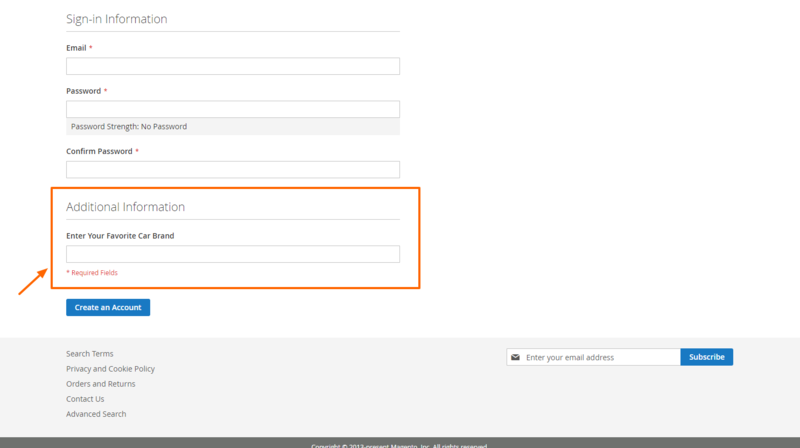 Organize additional form inputs into usable groups. To upgrade the extension to the latest version, follow the same procedure as for initial installation (which is described in the next chapter). Always test the upgrade on a copy of your Magento before you upgrade your live store. Never go live with the upgrade without testing. Enable Magento maintenance mode. To enable the maintenance mode you can create an empty file named .maintenance.flag in your Magento's var directory. Magento will be offline after that. You will need to disable the maintenance mode after installation by removing this file. 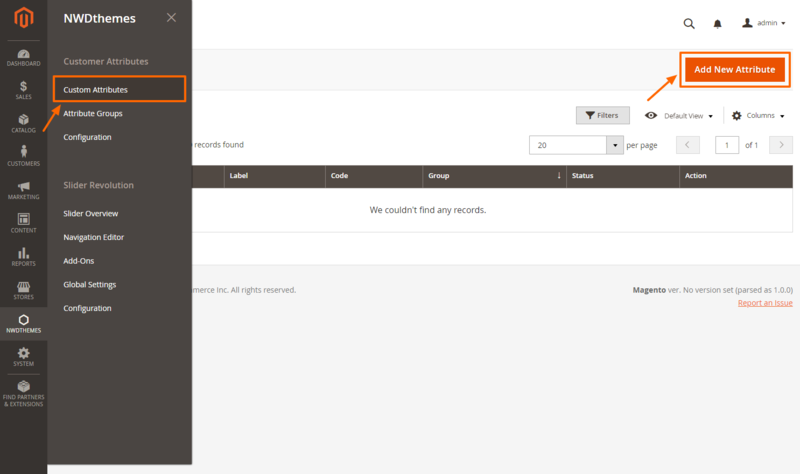 Log out from magento admin panel ( if you logged in ). Upload content of package/Extension to your magento root directory. Set correct file permissions for all the files which you uploaded to your server. CustomerAttributes is now installed on your Magento system. If you have other cache services such as Redis, Varnish, please also flush cache of those services. Deploy your store if needed. To create new custom attribute navigate to NWDthemes > Custom Attributes and click Add New Attribute. For editing existent custom attributes navigate to NWDthemes > Custom Attributes and select Edit action on appropriate item in attributes list table. Attribute Code - unique attribute code for internal use. Can be set only when creating attribute and can’t be edited later. Input Type - type of attribute input element. Can be set only when creating attribute and can’t be changed later. Input Validation - select validation rule that will be used to validate this element. Applicable only for Text Input elements. Frontend Class - css class that will be added to input element on frontend. Can be used to decorate elements with custom css styles. Allowed Extensions - comma separated list of extensions of files allowed for upload. Applicable only on image upload elements. 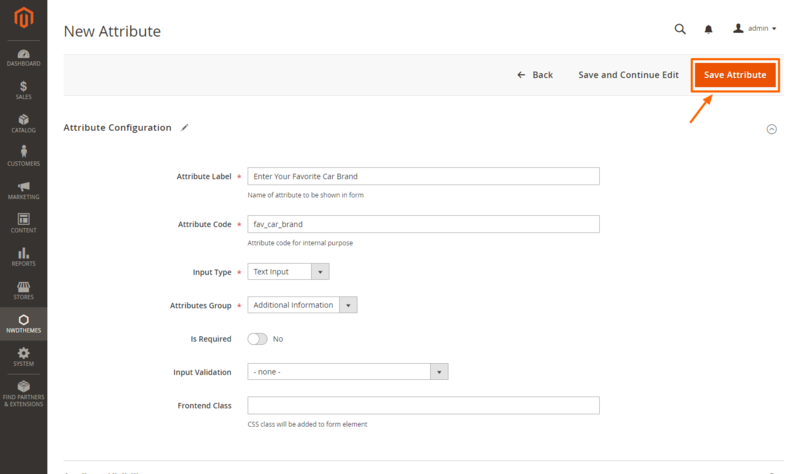 This part of custom attribute form allows to add, edit and remove options for Select and Select Multiple attributes. You can specify different option labels for specific store views. Dependency Condition - select value that will make your attribute visible. If other options are selected your attribute will be hidden and not required in form. To create new attribute group navigate to NWDthemes > Attribute Groups and click Add New Group. For editing existent attribute group navigate to NWDthemes > Attribute Groups and select Edit action on appropriate item in attribute groups list table. Help & Support > Support Policy.